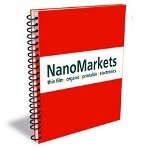 NanoMarkets has a released a new report on global medical polymer market, which represents a key opportunity in the medical materials market over the next eight years. Building-integrated photovoltaics (BIPV) represents the merging of the building materials and solar panel business, with the "integration" part of the equation implying everything from novel forms of attachment to a building through to full-scale monolithic integration of PV layers into a tile or window. Medical ceramics is well-established in dental and orthopedic implants and provides a large number of patients with problem free tooth and bone replacements. The report studies new developments in metal meshes making it a serious contender as a transparent conductor. Previously metal-based transparent conductors would be lumped together in a single category, however it now differentiates between metal meshes in which the metal is patterned in a regular way and nanowire structures, in which much smaller metal structures form a random network. This report provides an in-depth analysis of the worldwide automotive smart glass market, covering self-tinting, self-cleaning, self-healing and device-embedded glass. In the last one year, there have been considerable changes in the transparent conductors (TCs) market. Intel and Microsoft’s efforts to bring touch screen technology to laptops have suggested new opportunities for non-ITO TCs. There will be a growing dependence of the 21st century civilization on effectively harnessing and developing the technologies offered by ionizing radiation. Nanosensors are devices that can detect nanoparticles find application in the field of medical diagnosis and may be commercialized in domestic, security, military and environmental monitoring applications as also other areas. 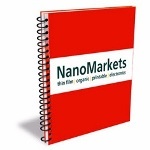 NanoMarkets has released a new report titled ‘Market Opportunities for Quantum Dots in Lighting and Displays’. The report gives a thorough market analysis of the major opportunities available in the field of quantum dots (QDs). Over the past five years, smart or self-dimming windows are increasingly being used in both commercial and residential building markets. They are also being utilized in trucks and automobiles. Although different types of smart windows technologies are available in the market, all of them are made of materials that play a significant role in one way or other. The smart window market has been tracked by NanoMarkets for five years and comprehensive studies of this market have been produced as also related businesses including the smart windows materials markets and smart auto glass.